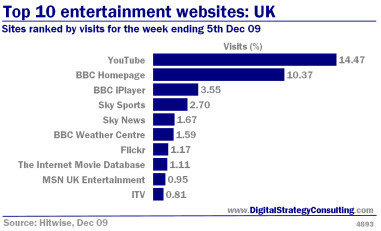 Entries from Digital Intelligence tagged with "consumer insight"
Marketing budgets at UK companies were cut for the ninth quarter running at the end of 2009, but the rate of decline was the slowest for two years as marketers switched their budgets to the web, according to a new report. The latest Bellwether Report, released by the Institute of Practitioners in Advertising (IPA) and accountancy group BDO, also found that companies were at their most optimistic for five years. The report said 25 per cent of companies reported a fall in total spending, while 18 per cent reported an increase. The balance of -7 is a marked improvement from the -15 the previous quarter and was "the highest since the first quarter of 2008, and well above the record lows seen in late 2008 and early 2009". Nine in ten (90%) of Brits always tick the opt out box on marketing communications to prevent their data from being passed to third party, according to a new survey. The study, from the Direct Marketing Association (DMA), shows that marketers are continuing to underestimate the percentage of consumers who readily welcome items of direct marketing. The 2009 Marketing-GAP Tracking Study, conducted by online market research company fast.MAP, found that the expert panel expected 57 per cent of consumers to always tick the ‘opt-out’ box on marketing communications to prevent their data from being passed to third party, when in fact 90 per cent of consumers always do so. The study looked into consumer attitudes to marketing has revealed that email is consumers’ favourite direct marketing channel. Google's Chrome web browser has overtaken Apple's Safari to become the third most popular web browser, according to new research. 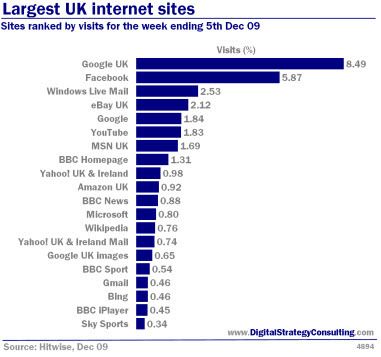 The data, from Net Applications, puts Chrome in third place with 4.63% of the market, ahead of safari with 4.46%. Google’s browser, which launched just over a year ago, still has a lot of ground to make up to match market leaders Microsoft’s Internet Explorer (63%) and Mozilla’s Firefox (25%). Chrome's 0.7 percent jump from November to December can partly be attributed to the beta launch versions of the Chrome Web browser for Mac OS X and Linux. 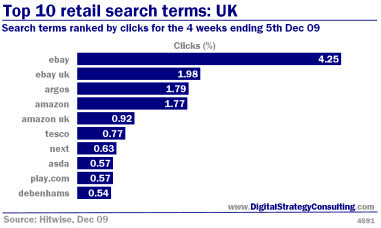 90% of European internet users go online weekly to search for information, while more than 4 out of 10 consumers search for information on brands and products via comparison, expert and user review sites, according to new research. The new report, from Marketers & Consumers, Digital & Connected was conducted in 16 European countries.It also found that the web is the platform for a lively peer-to-peer economy, a third of European internet users have sold something to another user via online classified or auction sites. 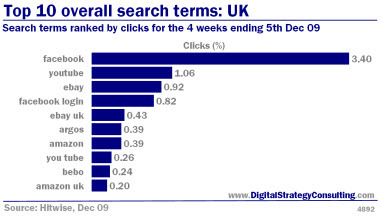 Search terms ranked by clicks for the weeks ending 5th Dec 09. 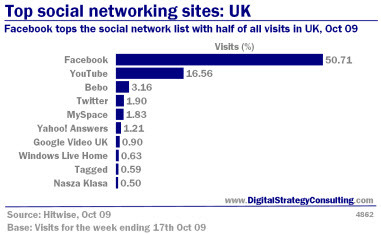 This week the audience of socnet giant Facebook broke the 350m user barrier, setting new records for social networking both globally and here in the UK. The national numbers see Facebook’s audience rise to a staggering 23m uniques a month, but the jaw-dropping statistics are in the frequency of use. Half of all British Facebook users return daily, confirming the platform’s position as the most engaging social media player. Google is testing skippable ads on YouTube, as the search giant looks to find new ways to monetise the video-sharing site. The concept of the ad unit is that while users are given the tools to skip the ads they don't want to see, when they do in fact watch them, they will do so with more engagement. Google is opting-in advertisers running video campaigns via AdWords for the test. It will display a small text option in the right-hand corner of the viewer, reading, "Skip this ad." Clicking that text takes users directly to the videos they wish to play. YouTube is running the experiment on clips produced as part of its partner program with creators who have elected to include in-stream ads. Three-quarters of Brits would consider paying for digital content if it only cost 10p or per article, with Jeremy Clarkson the most likely columnist to entice punters to hand over their cash, according to a new survey. The report, by Continental Research, found The Sun's Jeremy Clarkson, the Guardian's Charlie Brooker and the Daily Mail's Richard Littlejohn are the UK national press's most "valuable" columnists online. The poll indicated that micropayment systems looked more palatable to consumers than monthly or annual subscription systems. People who use peer-to-peer filesharing websites like Pirate Bay to illegally download music spend over £30 more on music per year than those who do not download illegally, according to new research. Internet users who claim to never illegally download music spend an average of £44 per person on music per year, while those who do admit to illegal downloading spend £77, amounting to an estimated £200m in revenue per year. The findings suggest that government plans to disconnect repeat illegal downloaders from the internet, announced yesterday by Lord Mandelson, could do the music industry more harm than good by punishing core consumers. The poll showed that the availability of new, appealing legal music provision services is the step most likely to encourage illegal downloaders to stop, above fines or the threat of disconnection. Consumers need more information and education about online privacy and online behavioral advertising (OBA), according to new research. The study, from the Internet Advertising Bureau and business law firm Olswang, found that 72% of internet users are unaware of online behavioral advertising – the practice used to deliver relevant advertising based upon previous web browsing activity. In addition, 81% of internet users do not know the control they have over behavioral advertising, in particular their right to opt-out. Online spending in Britain rose at its slowest annual pace in September since records began in 2000, hit by promotions from store groups, warm weather and disruption to postal services. The IMRG Capgemini e-Retail sales index showed online sales rose a lower-than-normal 1.9 percent month-on-month in September to 3.9 billion pounds and were up 7.6 percent on the year. "The results for September show a slowdown in the growth of online spending but we view this as a temporary blip and expect growth rates to return to the 15 percent year on year trend we have seen over the last year," said Mike Petevinos, head of consulting for retail at Capgemini UK. 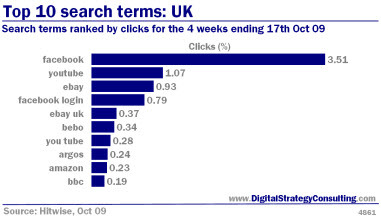 Search terms ranked by clicks for the 4 weeks ending 17th Oct 09. 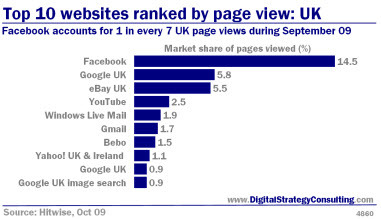 Facebook accounts for 1 in every 7 pages viewed by UK Internet users, and is now more than twice as big as Google in terms of page views, according to new research. 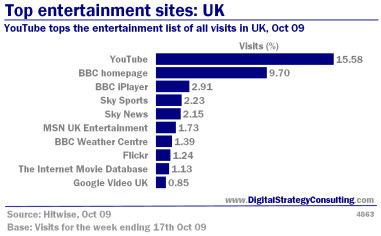 The findings, from Experian Hitwise, reveals Facebook accounted for 14.5% of all UK Internet page views during September 2009. Over the last year, visits were up 86.1%. Tesco has seen its online sales up by 11% to £1bn during the first half of the year, as the supermarket giant plans to launch a new online clothing range.Profits at Tesco's online retail business, which includes grocery sales and Tesco Direct, rose 21% to £58m. The number of customers using Tesco's online grocery business grew to over one million during the first half of the year, Tesco said. 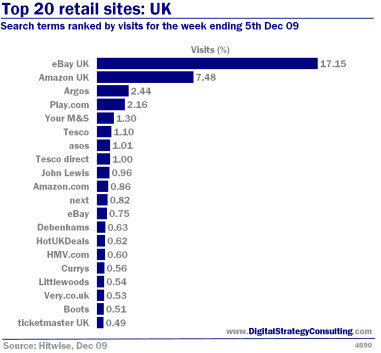 Tesco direct, which retails non-food items over the internet and catalogues reported sales up 29%. The service delivers to customers homes or to 240 in-store Direct desks.